Episode 100 focuses on Universe 6 female Saiyans Caulifla and Kale, who soon square off with Goku. Caulifla and Goku go at it, with the former teaching the latter how to push further and reach Super Saiyan 2, which is a bit of the kick in between the legs of Gohan’s amazing transformation from back in the Cell Arc of DBZ, but hey ho…During this battle the frail and afraid Kale feels bad for not joining in and fires a weak blast that distracts the two, leading to her being to told to stay out of it. This puts Kale into a rage due to his inability to live up to Caulifla’s expectations and she turns into a Legendary Super Saiyan, a.k.a. Broly, the lead villain of DBZ Movies 8, 10 and sort-of 11, but with lipstick and a tube top. Kale has insane strength, her destruction of the fighting arena is seen in all later episodes as background rocks and such, and focuses her hatred on Goku, only able to say “Son Goku”, much as Broly was only able to say “Kakarot” as his rage increased… it’s an odd thing really. They pretty much wrote Broly into the main Dragon Ball canon, but also went in a different way with it. The focus mostly stays on Kale and Caulifla throughout Episode 101, though the two female Super Saiyans end up in conflict with fighters from Universe 11’s “Pride Troopers” group rather than “our” heroes. Episode 102 sees a group of gag parody magical girls from Universe 2, Brianne, Sanka Ku and Su Roas, do their whole love-based magical transformations into un-magical forms (Brianne being an unattractive overweight girl, Sanka turns into a wild beast warrior, and Roas turns into a … Chinese martial artist?) and end up fighting with various characters from “our” universe. 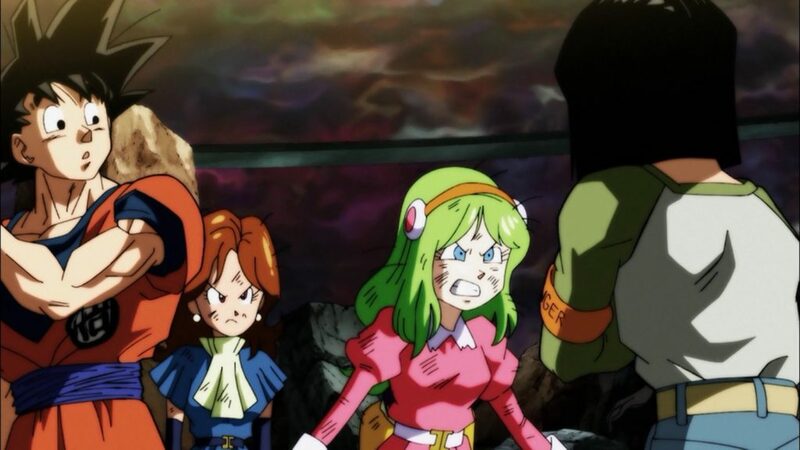 When they first try to transform they are blasted by Android 17, who then gets a legitimately funny scolding from Goku, Toppo of the Pride Troopers and the magical girls themselves, telling him he was wrong to interrupt a transformation sequence. 17 defends himself by saying “but they were wide open…” and then shrugs. It’s a funny, nearly fourth-wall breaking moment. Episode 103 focuses on Gohan, who ends up fighting some strong warriors from Universe 10. As you’d imagine, it’s played as if Gohan is once again going to fail due to his lack of training, only for him to overcome his limits and all that jazz. It’s a fine episode, and ends on a sombre note. Admittedly I was a little baffled that after staying in a tight group thanks to Gohan’s strategy, “our” warriors split up when the ring gets roughed up in Episode 100 for reasons I’m still not sure on in-universe, but obviously it’s done so Gohan and other characters can get some solo screen time. So there we have it, a set of six episodes that is literally non-stop action. It’s been a long time since such a heavy dose of Dragon Ball fight scenes have aired, and it’s been enjoyable, from the serious fights to the gag fights, they have at least kept me entertained and interested each week. By the sounds of a recent press release, there is a one-hour special (or two episodes aired back-to-back after a one week break) on October 8th that features the start of the battle between Goku and super-powerful warrior Jiren, and would you believe that the end of that one hour special makes six episodes from now? Handy! I’ll see you then!